Hi, all! The holidays are upon us, and for many of us, so is the winter chill (with or without the snow yet), and I have an idea just in time for the holidays that could be beneficial to everyone! 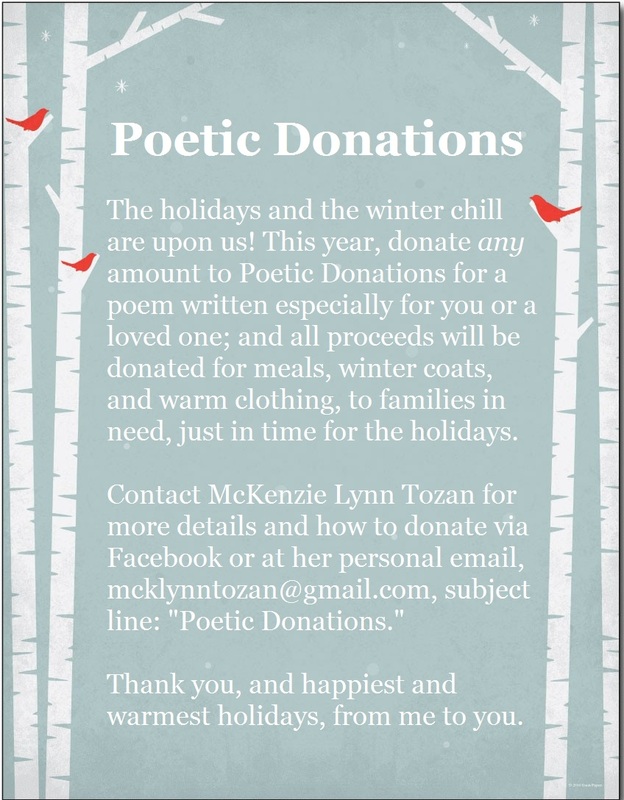 Contact me, either over on Facebook or at mcklynntozan (at) gmail (dot) com, and I will write and send you a poem, for you or a loved one. You can specify the title you want, the theme, a line you want in it, who the poem is for, anything! Within 24 hours, you will have a nice, new poem to savor or give away. Here’s the catch, though: When you request a poem, I will ask you for a monetary donation. Of any size. It can be 5 cents, it can 5 dollars, it can be ANY amount, and all of those proceeds will be donated at the end of December for meals and winter coats and warm clothing for families in need. I have included the original flyer below, which is already circulating on Facebook, as well as the hashtag #poeticdonations. Please help, please share, please donate; it’s for a good cause. Thanks, all! All my love and warm wishes, this holiday season and every season. Previous Poem up at Whale Road Review today!